The Democratic People’s Republic of Korea (DPRK) on Sunday [January 7] sent the list of its five-member delegation to South Korea through the restored hotline in the truce village of Panmunjom for next week’s high-level inter-Korean talks, Seoul’s unification ministry said. The DPRK delegation will be led by Ri Son-gwon, chairman of the Committee for the Peaceful Reunification of the Fatherland (CPRF), according to South Korea’s unification ministry in charge of inter-Korean affairs. 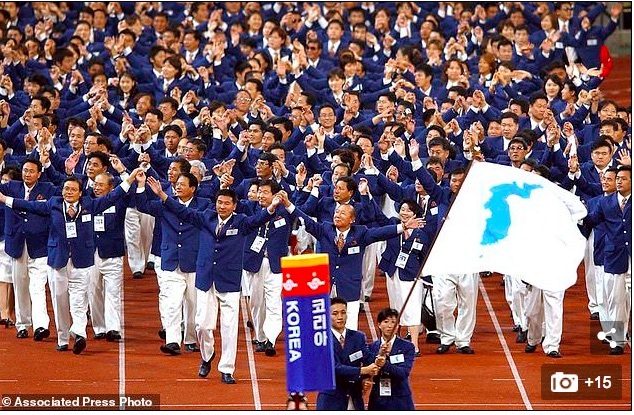 In this Sept. 29, 2002 file photo, athletes from North and South Korea march together, led by a unification flag during opening ceremonies for the 14th Asian Games in Busan, South Korea. Four other delegates included CPRF Vice Chairman Jon Jong-su, Vice Minister of Physical Culture and Sports Won Kil-u, CPRK Director Hwang Chung-song and Ri Kyong-sik, a member of National Olympic Committee of the DPRK. The previous day, South Korea already sent the list of its five-member delegation to the DPRK. South Korea’s chief delegate would be Unification Minister Cho Myoung-gyon. Four other delegates were Vice Unification Minister Chung Haesung, Second Vice Minister of Culture, Sports and Tourism Roh Tae-kang, Ahn Moon-hyun, deputy director-general at the Prime Minister’s Office, and Kim Ki-hong, a vice president of games planning at the organizing committee for the 2018 Winter Olympics and Paralympic Games. The DPRK accepted South Korea’s dialogue overture Friday, agreeing to hold senior-level, inter-governmental talks Tuesday at Peace House in the South Korean side of Panmunjom that straddles the inter-Korean land border. The hotline of direct dialogue between the two Koreas was reopened earlier this week for the first time in almost two years. Signs of a thaw were seen on the Korean Peninsula as top DPRK leader Kim Jong Un said in his New Year’s address that his country was willing to dispatch its delegation to the South Korea-hosted Winter Olympics set to kick off in February. South Korean President Moon Jae-in agreed earlier this week with U.S. President Donald Trump that the two allies would not conduct the annual springtime war games between Seoul and Washington during the Winter Olympic period.